Oatmeal is a nutritious breakfast, but it isn't a weight-loss miracle food. You'll still need to eat fewer calories than you burn to lose weight. The fiber oatmeal contains may help you control your hunger and eat less, however, making it easier to lose weight. All types of plain oats are similar in nutrient content and calories per serving, so you can choose the type that best suits your needs and desired serving size. When you eat foods containing fiber, such as oats, it can help increase feelings of fullness so you eat fewer calories throughout the day. For example, the beta-glucan fiber in oats absorbs water and swells in your stomach, increasing satiety. Some types of fiber found in oats may also slow the emptying of your stomach, causing this feeling of fullness to lasts even longer. Eating an extra 14 grams of fiber per day for 3 months may increase weight loss by about 4 pounds, according to a review article published in "Comprehensive Reviews in Food Science and Food Safety" in July 2012, which recommends getting at least 25 grams of fiber per day. 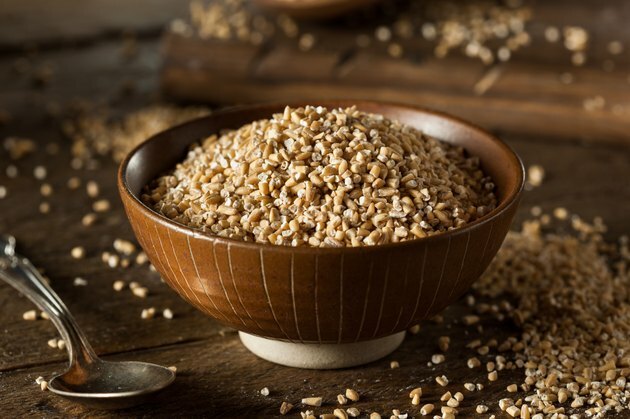 Steel-cut oats are oat groats that have been chopped into pieces, while rolled oats, including quick and instant oats, are oats that have been steamed and rolled flat. Because steel cut oats are denser, a serving is 1/4 cup of dried steel-cut oats compared to 1/2 cup of rolled oats. Both servings weigh the same and contain approximately 150 calories, 3 grams of fat, 27 grams of carbohydrates, 1 gram of sugar, 4 grams of fiber and 5 grams of protein. If you eat the same volume of steel-cut oats as rolled oats, you'll wind up eating a lot more calories, which wouldn't be good for your diet. Plain rolled oats, whether you choose regular, quick or instant, contain about 166 calories per cup of prepared oatmeal. Packaged flavored instant oats are a lot higher in calories due to the added sugar they contain. For example, cinnamon and spice instant oatmeal has 230 calories per cup and raisin spice instant oatmeal has about 211 calories per cup. While plain oats have just 0.6 gram of sugar per cup, flavored instant oatmeals have 15 to 20 grams of sugar per cup. When buying flavored oatmeal, look for brands with oats listed as the first ingredient, and choose the brand with the least sugar and sodium and the highest amount of fiber, recommends registered dietitian Kati Mora in an article published in "Fitness" in January 2012. Start with plain oatmeal and mix in nutritious extras to give it more flavor and more nutrients. Cinnamon or allspice will give your oatmeal a bit more of a sweet taste without increasing the sugar content, and fresh or frozen fruit can contribute lots of flavor, sweetness and nutrients without adding a lot of calories. Nonfat Greek yogurt can increase the protein in your meal and make it creamier. Flaxseeds, nuts, nut butters and sunflower seeds are also nutritious, but limit them to no more than 1 tablespoon per bowl of oatmeal because they are high in calories. Can Eating Oatmeal Help You Lose Weight?